Try the gourmet Maille dijon mustard with honey. With the tart warmth of dijon mustard and the smooth sweetness of honey, Maille Dijon mustard with honey is the perfect balance of flavours. With 270 years of experience, Maille is the expert in craftsmanship, this combined with only selecting the best ingredients ensures that Maille mustard is the most delicious mustard available. 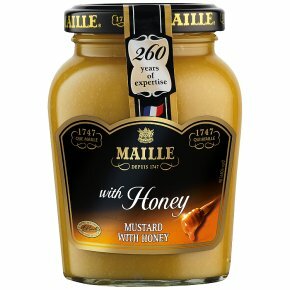 Try Maille dijon with honey as a sweet side to a steak or as a twist on a classic french vinaigrette, use to make honey mustard chicken or as a unique flavour on a cheese platter. Maille mustard is the french mustard of choice for chefs and is guaranteed to add a gourmet touch to your dish. Gluten free. Enjoy the warmth of the classic and original Maille dijon mustard with the added taste sensation of sweetness from honey. Add a touch of gourmet quality and flavour to your dish with Maille dijon with honey, perfect added to dressings, marinades and sauces. Named after the home of french mustard, this blend will give your dish a unique flavour profile. This mustard is consistently adored by those who taste it, will gloriously enhance the flavours of food and is a key ingredient for anyone who enjoys playing with flavour in the kitchen and taking the quality of their meal to the next level. At Maille, we cut our seeds rather than crush, to ensure the smoothest possible texture. At its best when served alongside steak, our dijon with honey is an ideal addition to dishes and particularly delicious with sausages or as a key ingredient for any french salad dressing. Why not try adding it to a cheese board for a unique serving accompaniment? It's also delicious used to create a tasty honey mustard sauce for chicken. Be braver with flavour and experiment with Maille dijon mustard with honey to your dishes. For the classic taste of dijon mustard, try Maille dijon originale ? the mustard dates back to the beginning of Maille in 1747 and gives the delicious tart warmth of mustard.